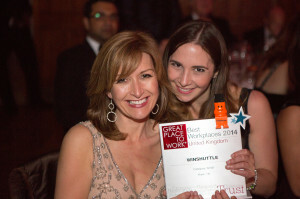 Wimbledon, UK – May 29, 2014 – Winshuttle is proud to announce that it has been recognised as one of UK’s best companies to work for by the Great Place to Work® Institute. Out of the 6,000 global companies that entered the Great Place to Work® Awards, Winshuttle ranked 7th in the UK’s Small Business category and was the highest ranked software company in that category. The company’s success in the Best Workplaces 2014 highlights its dedication to creating a culture of respect, camaraderie and innovation across all levels of the organisation. The Great Place to Work Institute conducts research and recognises leading workplaces in more than 45 countries on six continents. Based on results of surveys representing more than 10 million employees around the globe, the Best Workplaces’ Programme forms the basis of the world’s largest and most respected set of studies of workplace excellence, management and the role of trust in workplace culture. Organisations which take part in the Best Workplaces Programme are evaluated using a unique methodology which combines the results from the employee survey (Trust Index©) and the management survey (Culture Audit©.) Winshuttle’s outstanding results reflect how positively its employees feel about working for the organisation. Founded in 2003, Winshuttle continues to expand its operations and seek top talent across the globe. Its employees are driven by a common passion to design, develop, deploy and support products that enable global customers to maximise their ERP software investments. To explore current employment opportunities, please visit https://www.winshuttle.com/about/company/careers/.